Comfortable to wear inside the waist band and glove fit like a glove. 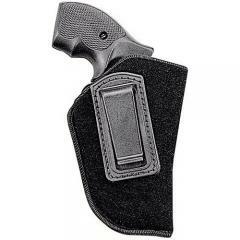 This holster works extremely well for concealed carrybackup at a great price. It works well enough, does take some getting accustomed to. I have a right and left for my 1911, very comfortable to carry. Great holster, my first one lasted almost five years and that was daily, constant carry. My husband chose this based on our son's recommendation. And he loves it. This is what he uses now to carry his gun. Great product.